At Huron River Day on Sunday! 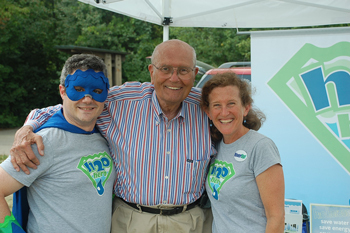 H2O Hero, Congressman John Dingell and HRWC's Laura Rubin enjoy Huron River Day! Over 70 H20 Heroes pledged to save water and energy with the help of a 5-minute shower timer at Sunday’s 32nd annual Huron River Day in Ann Arbor. The crowd braved the record warm weather to talk with HRWC volunteers and staff and get a photo with the H2O Hero, meet Congressman John Dingell, try a Huron Mystery Geocache Challenge hosted by the Michigan Geocaching Organization (MiGO), and enjoy food, music, paddling on Gallup Pond, a classic small boat show and plenty of family friendly activities. HRWC was there presenting information on the Saving Water Saves Energy project and other initiatives like RiverUp! and the Huron River Water Trail. It was inspiring to see so much enthusiasm and excitement for the Huron River. Thanks to the HRD Committee for organizing such a great event, to Bob and Beth Hospadaruk and Steve Fritz of MiGO, to HRWC volunteers Korinne and Joe Wotell for helping with the HRWC booth, and to Congressman Dingell for his support of HRD. Hope to see you next time at HRD 33!